C1q Nephropathy is a kidney disease in which a large amount of protein is lost in the urine. It is one of the many diseases that can cause the Nephrotic Syndrome (see below). C1q is a normal protein of the immune system, and can be found floating in the circulation of most healthy people. In C1q Nephropathy, however, this protein can also be found deposited throughout the kidneys. Since these deposits can only be seen under a microscope, a kidney biopsy is required to diagnose C1q Nephropathy. The kidneys normally work to clean the blood of the natural waste products that build up over time. To do this they have to filter all of the blood in the body many times each day. That is in fact what urine is- filtered blood. Normally, the kidneys can filter this blood without losing any of the proteins that are supposed to remain in circulation. When the kidney filters are damaged, however, protein sometimes “slips through” into the urine. This is called proteinuria. C1q Nephropathy is one of the more recently discovered kidney diseases, and doctors are still trying to figure out exactly how to describe and treat it. As a disease, it is very similar to two other diseases on this site, Minimal Change Disease and FSGS. First, a quick overview of the kidney- most people have two kidneys, one on each side of their lower back. All of the blood in your body passes through your kidneys many times during the day, and each time blood goes through some of it gets filtered by the glomeruli (singular = glomerulus). This filtering is how your body cleans the blood (and removes extra water), and some of the filtered blood becomes your urine. Urine isn’t red (like blood) because the red blood cells, which give blood it’s color, are too big to fit through the filters. A glomerulus is just a tiny bag of blood vessels through which blood gets filtered, and all of the filtered out blood (urine) runs into tubes (ureters) that eventually lead to your bladder. 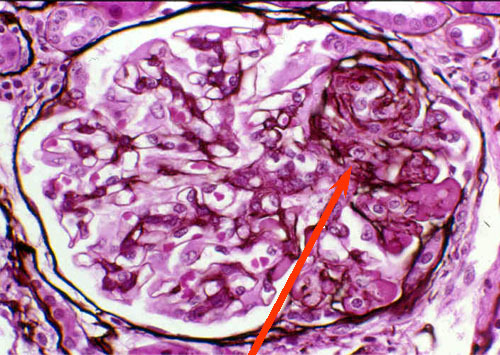 In C1q Nephropathy, the kidney filters can look absolutely normal under a standard (light) microscope (though they can also have visibly “scarred” areas as well- see FSGS). It is not until special “stains” specific for the C1q protein are added to the sample that the differences can be seen. 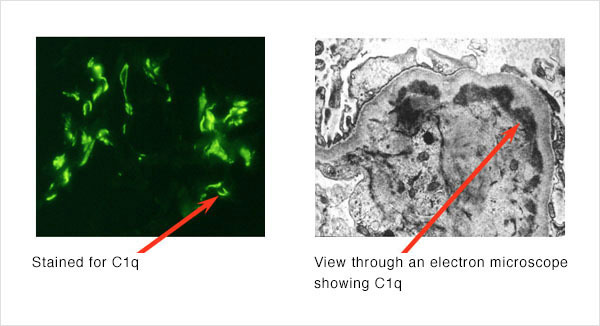 These stains cause the areas of the biopsy where C1q has deposited to glow bright green under certain types of light. Also, if the biopsy is evaluated under an “electron microscope”(which can magnify an object over a million times), the C1q deposits themselves can be seen. Both of these are shown below. We don’t yet know why C1q Nephropathy develops, or why some people deposit C1q in their kidneys while most do not. We think that the deposited C1q activates the immune system within the kidney itself, and the resulting immune response and inflammation is what causes the kidney damage. Like Minimal Change Disease, it is more common in childhood. However, now that doctors know what to look for, many more cases are being seen in early adulthood and middle age. The most noticeable symptom of C1q Nephropathy is often edema, or swelling, which can be profound. This typically starts in the feet and legs, but can move into the hips and abdomen as well. Other symptoms include high blood pressure, high cholesterol, and a tendency to form blood clots. Protein levels can be measured in a urine sample, and kidney function can be calculated from a blood test alone or measured more directly by adding a 24-hour urine collection. C1q Nephropathy can cause proteinuria alone or proteinuria and renal failure together, so both must be assessed by your doctor. None of the above symptoms, or even all of them together, is specific for MCD. If you or your doctor are concerned about MCD, the only way to know for sure is to have a kidney biopsy. C1q Nephropathy often causes the Nephrotic Syndrome. C1q Nephropathy is not an easy disease to treat, and anyone with this disease should be seen regularly by a kidney specialist. It is important to be on a medication that reduces the amount of protein in the urine. These medications are called ACE-inhibitors (angiotensin converting enzyme inhibitors) and ARBs (angiotensin II receptor blockers). If urine protein levels are high, the complications of the Nephrotic Syndrome should also be considered; patients should receive routine cholesterol screening/treatment, and their physicians should always remember their tendency to form clots. Finally, every patient with C1q Nephropathy must have their kidney function monitored regularly. If kidney function declines, certain other interventions may become necessary. In addition to the above, many different types of immunosuppressants, or drugs that suppress the immune system, are also being used to treat C1q Nephropathy. The most common of these, and perhaps the most successful so far, are steroids. Unfortunately, all of these drugs have significant side effects, and their use must be considered on a patient-by-patient basis. Because it is both a relatively new and relatively rare disease, it is difficult to predict the course of C1q Nephropathy. While some people have been known to go into complete remission, others have gone on to develop end stage renal disease requiring dialysis or a kidney transplant. Fortunately, complete renal failure so far seems to be the exception rather than the rule. The kidney biopsy can sometimes help predict the course of the disease as well.